Warner Bros envisions the future of movies and applies for a patent - Blust -VR Blust. Enjoy 4k Movies, 4k TV, 4k games and VR in full cinema definition. 7 days ago, the Thursday before Easter, a Warner Brothers US patent application was published and the movie business shifted fundamentally into the next era: the era of Augmented Reality (AR), Virtual Reality (VR), Merged Reality (MR), and every kind of reality (xR). While everyone was running around looking for a killer app for AR, Warners correctly intuited that the next thing after 3D goggles in cinemas and at home is AR goggles. And a little over a year ago, they patented it. Which is great if you’re Warners but has some pretty fundamental implications for everybody else. This patent makes immediate sense. As anyone who has experienced VR and AR will tell you, it leaves 3D for dead. 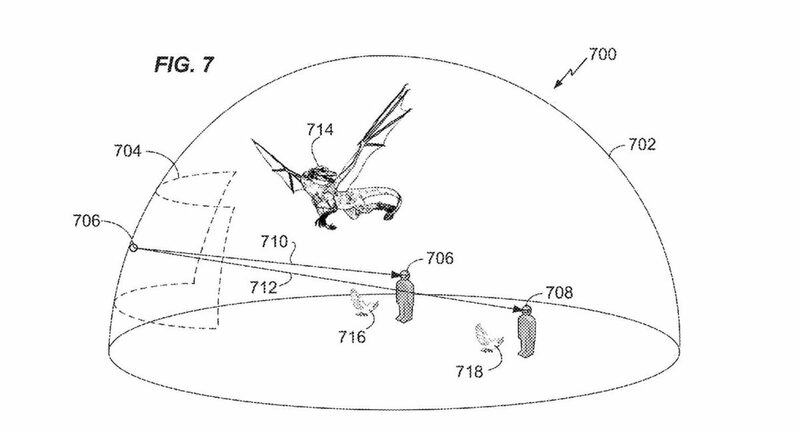 So when a dragon flies out of the screen in AR (the illustration above from the patent), your brain is going to believe a dragon flew out of the screen and is flying around the room. It’s going to require some pretty fancy pre- and post-production processing and data synching, but all very doable. This is, in fact, the main subject of the patent. It’s also going to be “desirable to develop…new methods.. for [producing] cinematic content for VR and AR, that… enhance the appeal and enjoyment of narrative content for new immersive technolo­gies such as VR and AR.” Bring that on! In the “preferred embodiment” (patent language), headsets will be wireless and served from a single server. It may take a while to get to that, but we can easily imagine (and the patent contemplates) an interim step with a small “personal server” mounted under the seat or the TV, with a Hololens, Meta, Google Glass or some new AR headset connected. The patent includes various control devices and haptics i.e. bio-feedback. Disney have also done a lot of work in this area and filed a number of patents e.g. a “haptic chair”. Visions of feeling the dragon’s tail swipe as it flies past and swiping back with a “sword”! A lot of attention is paid to co-ordinating 2D and VR/AR content. This is to allow viewers to take the goggles on and off and stay immersed. Necessary for those who get motion sick and of course for the obligatory visit to the in cinema candy bar. What is significant about all this is that Warners have thought deeply and for a long time about how this might all work. Including the need for new narrative story telling and production techniques. What the patent is silent on is the technical detail of how this will be distributed to, and within, cinemas and “home theatres”, and what it will play on. If the OTT Internet video streaming boom has shown anything, it’s that this is a very real challenge. AR and VR data files and executables can be bigger than even 4K movies. Especially if they contain a render of the 2D movie as the patent contemplates. As well as significant bandwidth, AR and VR executables need significant processor and graphics grunt. Traditional distribution via CDN may not cut it. Innovative solutions such as peer to peer have been used in gaming and should be applicable here. This would also work well for in cinema distribution and updates. Security will, of course, be critical. Luckily some other people have been thinking deeply about this aspect of the problem, perhaps for even longer than Warners. We also applied for a patent. If we all team up, work hard and get lucky, you might just be able to experience the Oasis in cinemas in time for the release of Ready Player One. I’ll be first in the queue!